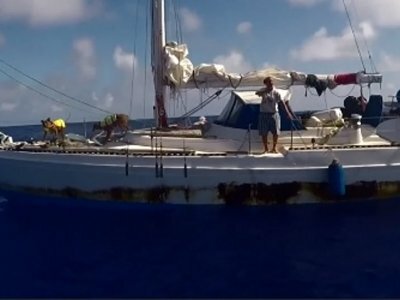 They had left Honolulu on May 3 aboard Appel’s 50-foot vessel the Sea Nymph for what was to be an 18-day journey to Tahiti, followed by months of leisurely cruising the South Pacific before returning home. Disaster struck almost immediately when a storm battered their boat with 50- to 70-mile-per-hour winds for three days as they left Hawaii. They continued on anyway, thinking the vessel wasn’t that badly damaged. By the end of the month another storm had flooded their boat’s engine, however, and they discovered its sails and mast had been damaged enough earlier that they could no longer generate adequate wind power to keep the vessel on course. “We incurred incredible damage,” Appel said of the 24-hours under tow that were the scariest of the trip. It didn’t help that the women only spoke English, a language not spoken on the fishing vessel. “We had a really tough time communicating with them that they were going to sink us within the next 24 hours,” she said. “Ok, we’re going to make it,” Appel told herself after sailors radioed from the Ashland’s bridge assurances that they did indeed see them. They thought they had packed enough to last a year but with the six-month mark approaching they discovered they had gone through 90 percent of it. The dogs’ food had run out and they were sharing theirs with them. “The dogs turned out to really like human food,” Appel said. One night, a group of tiger sharks began attacking their vessel, and the next morning, a shark returned and rammed the boat again, Appel said. “We were just incredibly lucky that our hull was strong enough to withstand the onslaught,” she said in a video interview provided by the Navy. Meanwhile, loved ones had no idea where they were. Appel’s mother said she contacted the Coast Guard when she hadn’t heard from her a week and a half into the voyage, and records show the Coast Guard put out a message on June 7 noting the vessel was missing. As months passed and Appel’s mother heard nothing she said she never gave up hope. Despite the ordeal, Appel says she’s far from done with the sea. If she can find and fix her boat she’ll be ready to take it out again. Associated Press writers John Rogers in Los Angeles; Mark Thiessen and Rachel D’Oro in Anchorage, Alaska; Becky Bohrer in Juneau, Alaska; and Ken Moritsugu in Tokyo contributed to this story.